CAIR-Dallas/Fort Worth executive director Alia Salem saw Trump's election as a fundraising opportunity. Over the election cycle the leaders and spokesmen of the Council on American-Islamic Relations (CAIR) took full advantage of the unorthodox candidacy of president-elect Donald Trump to fuel their usual arguments about a bigoted, "Islamophobic" America. Beneath their overheated rhetoric, however, Islamist social media activity in the hours after Trump's victory suggests they see some silver linings. First, Islamists see the election as a huge opportunity for fundraising. In a tweet sent as the returns showing a Trump victory were still coming in, CAIR-Dallas/Fort Worth executive director Alia Salem reminded supporters to give to local offices, not just CAIR-National. CAIR-Michigan executive director Dawud Walid called the election a confirmation of "what America is." Second, in the eyes of CAIR, the election confirms a useful narrative: that America is an inherently racist country, and that "Islamophobia" is an extension of the same primitive mindset. CAIR-Michigan executive director Dawud Walid can always be counted on to filter all news through a "What Would Malcolm X Say?" paradigm. 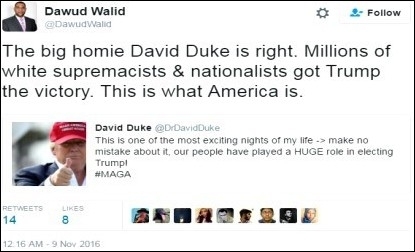 This election season was no different, with him asserting that "Millions of white supremacists and nationalists got Trump the victory. This is what America is." Third, the election appears to confirm the preference many Islamists have for the far left. CAIR-Connecticut executive director Mongi Dhaouadi pinned the blame for Trump's victory on the "Democratic establishment" for pushing Clinton. CAIR-Connecticut executive director Mongi Dhaouadi sees the election as an opportunity to discredit establishment Democrats. Zahra Billoo, CAIR-San Francisco executive director, openly proclaimed her third party vote. Compare the two groups of Islamists who donated to Clinton and those who supported far left rival Bernie Sanders and a clear pattern emerges. Sanders received many more donations of a small size: 242 donations totaling $9,485, making for an average donation of $39. Clinton received $67,656 in 163 donations, $415 the average. It may be that the Islamist leaders out in the field, working at the grassroots level, preferred one candidate and the Islamist board members in the background with the money to fund campaigns and CAIR chapters preferred another. David M. Swindle is the coordinator of Islamist Watch, a project of the Middle East Forum.